The sustainability website features up to date news and information concerning campus sustainability efforts, it covers any awards and recognition the university has received as a result of our sustainability efforts, and highlights students and student group sustainability interest and initiatives. It also hosts the sustainability annual report, where people can go to download a pdf version of the most recently publish Baylor University Sustainability Annual Report. Each semester a group of students from a Writing & Editing class compiles the Sustainability Newsletter. This newsletter highlights campus wide efforts that have occurred during the semester. While not made publicly available, a digital copy is made available to members of the University Sustainability Committee for them to distribute as they see fit. The Office of Sustainability uses all major forms of social media to engage the campus community and beyond. Twitter, Facebook, Instagram, and Tumblr are the main social media platforms put to use to showcase our sustainability efforts. The student newspaper assigns a beat reporter to the sustainability beat each semester. This has resulted in regular coverage in the student newspaper, the Baylor Lariat. All LEED and EnergyStar rated buildings feature the appropriate accompanying signage. Throughout the residence hall cafeterias, signs and posters are put on display indicating organic food, vegetarian options, and information about the sustainable practices our food services team currently engages in. We provide a walking tour of the East Village Complex which features three LEED certified buildings and grounds with sustainable features built in. The tour highlights the specific features found at the East Village Complex while also bringing attention to similar features found elsewhere on campus. The Baylor University Shuttle system has maps all over campus to inform students, visitors, and faculty and staff about the campus shuttle system and how to take advantage of it as an alternative to single car commuting. Students are provided information at orientation regarding cycling options and best practices. Campus bike lanes are clearly marked for navigational and safety purposes. 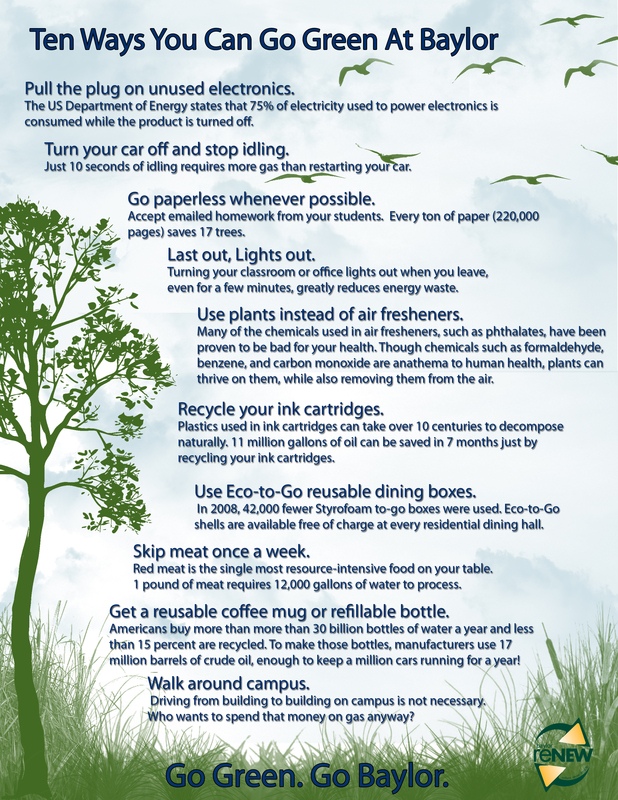 Available on the sustainability website is a 10 Ways to Go Green While on Campus flier for faculty, staff, and students to reference while living and working on campus. We have a very active Facebook page where we update our followers with photos from campus events, information on the latest sustainability happenings, and tips and tips on how to live a greener life.